Kakanin - Traditional sweet dessert and snacks. Kaldereta - Spicy meat stew in tomato and liver sauce. Usually red meat marinated in vinegar, salt and pepper, quickly fried/seared to seal in the flavors before sautéing in garlic, onion and stewed in tomato sauce, liver paste with carrot, potato, bell pepper and chopped sili (chili). Chicken or fried fish can also be use but goat meat is best for this dish. Kalingking - Sweet potato fritters. A sweet delicacy from Batanes made up of fried kamote (sweet potato) strips in flour and sugar batter. Kamote que - Deep fried kamote (sweet potato root) slices coated with caramelized sugar served in bamboo skewer. Kandinga - Bicolano version of bopis. Kare-kare - Stew in ground peanut/rice sauce. Made up of par-boiled oxtail, oxtripe or pork hocks stewed in ground toasted rice and peanut broth until texture is almost like gelatin with puso ng saging (banana bud), eggplant, sitaw (string bean), pechay and annatto extract for the orange tint. Serve with bagoong alamang (fermented salted krill). Other versions use assorted seafood instead of meat of just plain vegetables for the vegetarian. 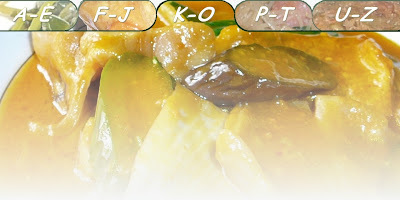 KBL - Acronym for Kadyos (Cajanus cajan), Baboy (pork) and Langka (jack fruit) an Ilongo dish boiled kadyos an round beans called pigeon pea or Cajanus cajan with seared pork pata (leg) or hocks, and unripe jack fruit soured with batwan (a round green fruit). KBL is also an acronym for Kamatis (tomato), Bagoong (fermented salted fish) and Lasona (onion) an Ilocano salsa or dip for grilled dishes. Kinilaw - Either fish, meat or vegetables eaten raw strait from the source or cooked/soaked in vinegar or any other souring agent. Kinilaw na Isda - Fish ceviche. Made up cubed raw fish soaked in vinegar and/or lemon juice with ginger, onion, sili (chili), salt and pepper. Kikiam – Finger patty made up of ground pork and vegetables or for seafood-based, usually made of fish meat and cuttlefish wrapped in bean curd sheets, deep-fried and served in bamboo skewer with sweet, sour or spicy sauce. Kinunot - Bikolano spicy stingray/baby shark stew in coconut milk. Shredded stingray or baby shark meat stewed in coconut milk and vinegar with ginger, onion, chili and malungay (moringe) leaves seasoned with salt and pepper. Kutsinta – Steamed rice cake similar to puto but the dough is made up of powder from boiled gelatinous rice with lye and brown sugar and steamed in cup cake moulds. Laing - Bicolano spicy taro leaves stew in coconut . Made up of dried gabi (taro) leaves including stalks. A Bicolano dish made up of dried gabi (taro) leaves stewed in coconut milk with ginger, onion, chili topped with either pork shrimp or daing (dried fish) seasoned with salt and pepper. Laswa - Ilongo boiled vegetables. Assorted vegetables boiled and seasoned with salt to taste, topped with shrimp or dried alamang (krill). Lauya - Ilocano word for nilaga (boiled) meat and/or bone. Lauya nga Pata - Ilocano pork leg and vegetable soup. Made up of boiled pork pata (leg) or hocks in black pepper, onion and salt with potatoes, cabbage and/or pechay. Leche Flan - Egg custard. Made up of egg yolks, milk and sugar, flavored with vanilla and/or grated dayap (lemon) rind steamed or baked in caramelized sugar coated llanera (aluminum molds) or cup cake molds. Lechon - Roast pig. Whole young pig or piglet with lemongrass or tamarind leaves and tendrils stuffing roasted in roasted in open charcoal pit, in bamboo pole skewer usually cooked at fiesta and other important celebrations. Serve with sarsa (liver sauce). Lechon Kawali - Crispy fried pork. Pan or deep fried slab of liempo (pork belly) boiled in salt, 7Up or Sprite, black pepper and bay leafuntil tender. Chilled and/or dried before frying for maximum crispiness. Lomi - Egg noodle soup. Thick egg noodles with pork, chicken, shrimp, fish ball and kikiam sautéed in garlic and onion with vegetables in broth/sauce thickened with beaten egg. Longganisa - Traditional cured meat sausage. Lugaw - Rice porridge or congee. Made up of boiled rice seasoned with salt and pepper and garnished with kasubha for the yellowish tint fried garlic and spring onion usually topped with boiled egg. Serve with tokwa’t baboy or vegetable spring rolls. Lumpia - Fried spring roll. Made up sautéed vegetable, ground meat or shredded fish filling rolled in wrapper made up of flour and egg white. Serve with vinegar with crushed garlic, salt and pepper or with sweet and sour, tomato or chili ketchup dip. Lumpia, Fresh Lumpia - Fresh vegetable roll. Made up of sautéed ground pork and shrimp in garlic, onion and patis (fish sauce) with julienne ubod (palm heart), carrot and green bean filling in lettuce leaf and egg wrapper made up of flour or cornstarch with egg. Serve with sweet sauce made up of soy sauce and sugar, garnished with finely minced garlic, crushed peanuts and chopped spring onion. Lumpiang Hubad – Fresh vegetable roll filling and sauce serve with out the wrapper. Lumpiang Shanghai – Fried meat roll. Made up ground meat, chopped shrimp, chopped singkamas, carrot with chopped celery, onion, soy sauce and beaten egg seasoned with salt and pepper filling rolled in wrapper made up of flour and egg white. Serve with sweet and sour sauce, tomato or chili ketchup dip. Macapuno Candy Balls – A soft sweet candy balls made up of grated macapuno (coconut) meat with sugar. Macaroni Salad – Pasta with mayonnaise and pickled relish dressing. Made up of boiled macaroni pasta (elbow or shell pasta) with mayonnaise, pickled relish, chopped onion and carrot dressing. Macaroons – Coconut cup cake - Made up of baked dried grated coconut, condensed milk, butter, eggs and sugar flavored with dayap (lemon) rind. Mais con Hielo – Sweet dessert made up of boiled sweet corn kernels with evaporated milk, sugar and topped with sheaved ice. Malasado - Half cooked. Half boiled egg. Mami - Noodle soup. Made up of pork, beef and or chicken broth topped with either shredded chicken, braised beef or pork, wonton dumplings and garnished with fried garlic and chopped spring onions. Mechado - Meat stew in tomato sauce. Made up of either pork or beef sautéed and slow stewed in garlic, chopped onion and chopped tomato or tomato sauce, soy sauce, lemon juice, liquor, bay leaf seasoned with salt and pepper with potato and carrot. Menudo - Meat and liver stew in tomato sauce. Made up of pork and liver sautéed and stewed in garlic, onion and tomato, with cubed potato, carrot, hotdog, raisins, bay leaf and bell pepper. Other version also uses chicken or beef. Minatamis na Saging - Sweet boiled banana. Made up for banana (saba variety) boiled with brown sugar and flavored with dayap (lemon) rind and/or vanilla. Misua - Fine rice noodles. Morcon - Stewed beef meat roll. Nilaga - Boiled meat and vegetable soup. Made up of either beef or pork boiled in peppercorn, onion and salt with potatoes, carrots, cabbage and or pechay. Nilagang Mais - Boiled sweet corn in cob and husk. Serve with butter or margarine. Nilasing - Cooked in liqueur or beer.